Ensure you never have to worry about losing your pet again with an engraved pet tag from Stan Wootton Locksmiths in Geelong. No matter whether you have a cat, dog, or any household or farm animal – we’ve got affordable and durable pet tags to suit any pet. Your pet tag will both complement your pet and stand out in an emergency. 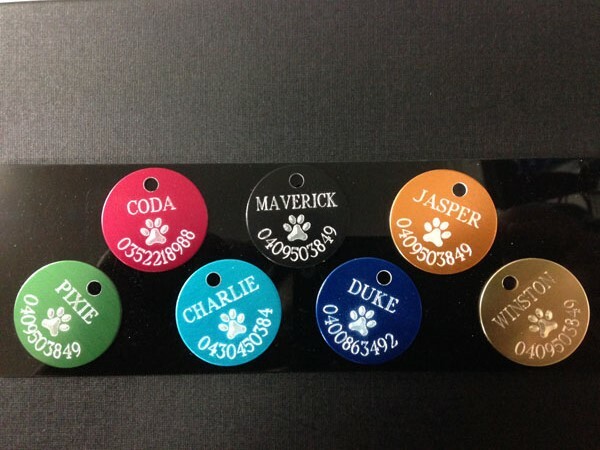 Our basic pet tags are anodised aluminium, available in 32mm and 25mm sizes. Choose from red, green, black, blue, turqoise or orange to suit your pet. This range also features 35mm and 30mm bone-shape tags, available in blue or pink. If you’re looking for a heavy-duty pet tag, our deluxe range features thicker options, silver-finished and including graphics of either a bone or paw. Choose from 30mm or 20mm pet tags, in red, blue, black and pink. We also stock a 32mm solid brass pet tag, and can create custom tags to meet specific requirements – including adding logos or other graphics. Add a touch of personalisation by engraving your pet tags with your pet’s name and a contact phone number. You can also choose to put your address on the pet tag, however many customers prefer not to add an address for safety and privacy reasons. Basic and brass designs can be engraved on both sides – usually your pet’s name on the front and contact numbers on the back, while deluxe tags can only be engraved on the reverse side. Choose from a range of fonts and font sizes, depending on the type of tag and information you want to include. Whether you’ve got a domestic house pet or more active farm animal, our engraved pet tags are made to last. Please contact Stan Wootton Locksmiths in Geelong for more information. If you’re worried about keeping your pet safely on your property, we specialise in installing and maintaining your home and garden locks. Our mobile locksmith can come to your property to perform fittings or repairs. Gallery images are intended as a sample only. Please contact us or view the entire range of pet tags available in our supplier catalogues.